Using the scale drawings from the Freshwater/Tesco planning application for work to the Arlington site in Margate, members of the local Conservation Area Advisory Group, Liam Nabb and architect Sam Causer have created a more detailed elevation of the drawing proposal seen from the beach. We can see how it will appear if the superstore portion of the development were completed without the seafront hotel and shops (these are outline planning only). This is the most likely scenario, as the seafront part of the development has so far only been submitted for Outline Planning Permission, and is not tied in to development of the rest of the site. There are no contracts or developers in place for a hotel, shops or any of the other seafront buildings, so if a developer were to come forward they would have to apply for a new planning permission meaning the site could remain empty for years to come. The developer is asking for permission to demolish the seafront side of Arlington without having a contract in place for what will replace it. Our concern is that without the seafront buildings the most dominant building on Margate’s seafront will be the five-storey face of a flat-roofed superstore shed, FIVE TIMES the size of Turner Contemporary, rising up out of a private superstore car park. 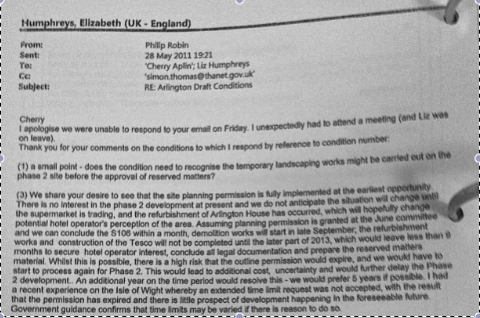 This means that planning permission for a superstore should only be granted when all contracts are in place and full plans for the whole site are proposed. We do not want to see a massive five storey shed and private car park right next to the beach, with queues of traffic blocking the seafront. We applaud the council for establishing these objectives back in 2008, but condemn them for failing to honour them now. This entry was posted in Planning and tagged Cherry Aplin, elevation drawings, hotel, King Sturge, Philip Robin, planning, Simin Thomas, TDC by arlingtonhsmarg. Bookmark the permalink.